I've thought about this topic deeply myself -- I have two blogs posts addressing your columns directly here and here, and last semester at a university I taught Mathematics for Elementary Educators, where I had them read your articles and included as one of my test questions to write a word problem where multiplication-as-repeated-addition is a bad way to think of the problem. 1. It is possible (via an axiomization of Tarski) to start with the real numbers rather than the natural numbers. It's the mathematical equivalent of the Davydov curriculum. So I take any statement that an operation is absolutely defined one way with a grain of salt. 2. A lot of people arguing against you seemed to have a special notion of what "is" is. I consider the standpoint essentially philosophical (my second blog post has more on this). 3. Using a category theory approach addition and multiplication are clearly very different, but I don't know if you're capable of explaining it at an elementary level that educators could understand (I have tried to write such a post and failed). Indeed there are several ways to define multiplication. In my above column I focus on the standard definition in Peano arithmetic, taking as my text the current Wikipedia description. 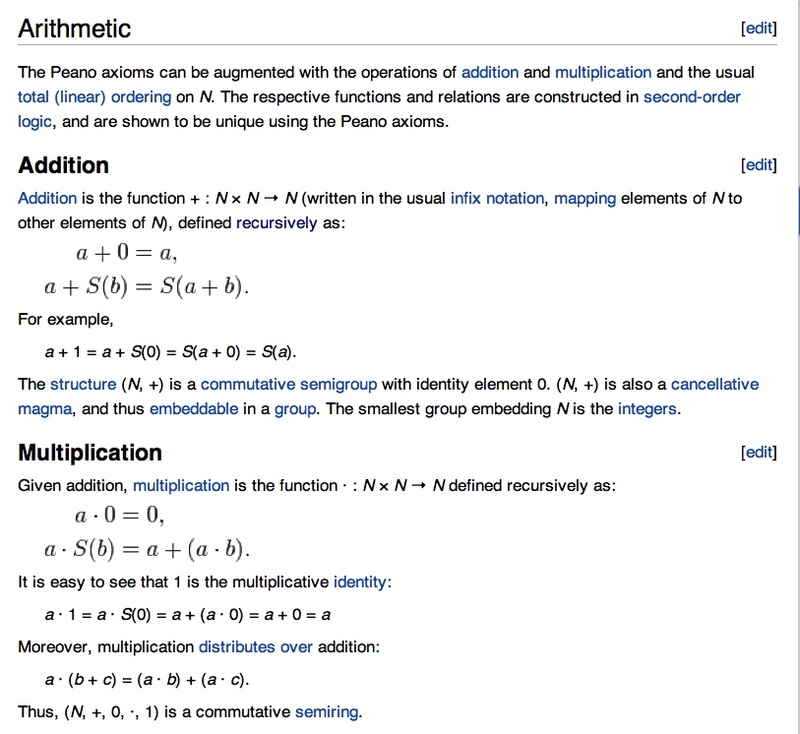 The Peano arithmetic definition was the starting point for the most common argument with any substance that was presented to me as purportedly showing that multiplication *is* repeated addition, but in fact what those arguments really showed was that many people do not understand the Recursion Principle and its role in mathematics. And that of course was the real focus of my column. I discussed the Davydov approach to arithmetic instruction (which I like) in another column http://www.maa.org/devlin/devlin_01_09.html. 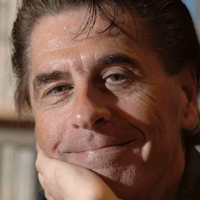 What worries me from a K-8 educational perspective is not the formal definitions, which were developed for mathematical, not education purposes, but that children are led to develop an intuitive conception of the mental operation of multiplication as being "just repeated addition", when in fact it is something very different. 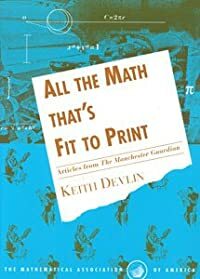 What the mental concept of multiplication is (or should be) was the focus of another of my columns, earlier this year: http://www.maa.org/devlin/devlin_01_11.html. Jason's blogs that he refers to provide some nice illustrations of these issues from the perspective of someone with far more active experience in K-8 education than I have. My expertise is on the mathematics itself, not how it is taught (as I have stressed to the point of likely boring my readers). I agree with jbdyer. The disagreement is a philosophical one that has to do with the use of the word "is". I address why multiplication is repeated addition here. Since it all still applies I'm not sure how to comment (by commenting I risk having people not read the post which is a much more thorough explanation...). Here is the main problem. You define a function M that you want to call multiplication. Go ahead. No one is going to stop you. Let me define a function. I'll call it M : NxN -> N. My function is M(n,m)=5. I'll call it multiplication. Why shouldn't I do that? Remember, your explanation can't involve repeated addition (or some a priori notion of multiplication that you want your function to match). If you say your M "is" by definition multiplication, then sure it isn't repeated addition, but that isn't what anyone means by multiplication. To take your own concrete example suppose you have a 5 cm elastic band and you stretch it to 10 cm. The new length is two times the old length. You have to explain what you mean by "is two times the old length". What everyone (except apparently you) means by this is that if you add the old length to itself you get the new length. Your function M is meaningless in reality if you don't relate it somehow. This is why you are backwards. You think that M just randomly happens to agree with repeated addition, when in fact the opposite is true. The useful notion "is" repeated addition (that's what I mean by "is") and it just happens to agree with your function and that's why we *define* your function to be multiplication and not the thing that returns 5 for every input. I don't think M randomly happens to agree with repeated addition. That outcome is transparentlybuilt into the recursive definition of M. (Hence my rhetorical irony.) But until you appeal to the recursion principle, you don't have a function. Repeating addition does not yield a function. It is an idea, not a sound definition. An idea that does not work in terms of defining a function. This approach is indeed "backwards" from a historical perspective, and perhaps a cognitive one. But this is very common in mathematics. We discover that our intuitions are unreliable, and work around that problem by turning things around, so what was a conclusion now becomes the starting point. BTW, this is not just my view; I'm just relaying the universally accepted mathematical definitions. As i mentioned in my original posting above, the infinite is at play here, and that is a tricky thing to handle correctly. I'm ready to hear a principled argument that teaching multiplication as repeated addition is harmful. The case Prof. Devlin (and others) make seems to be based on what multiplication *is* in the sense of what it is defined to be in higher mathematics, and this definition is dependent on needing it to be robust enough to build other mathematics on top of. I get all of that. And I dig it. But when we write curriculum, I'm not convinced that mathematical formalism trumps intuition and experience every time. Yet that seems to be the argument, right? We shouldn't work with a repeated addition interpretation of multiplication because that's not good enough for formalist mathematics. So let's accept that premise. Then it's incumbent on the arguer to offer the replacement. And I understand that the replacement is "multiplication as one of two operations on real numbers (together with addition". Fair enough. But then how do novices find products? I asked via Twitter and the reply was, "by learning to multiply". This is tautological, isn't it (or maybe just recursive)? How should students learn to multiply? By learning to multiply. So maybe Twitter is the wrong medium. Do I have it correct that children are to take the table of multiplication values as defined? That 3x4=12 because it is defined that way (rather than because 3 groups of 4 is 12)? And then multidigit multiplication algorithms are (nearly) all dependent on the distributive property of multiplication over addition. Again, children are to accept that property as part of the definition of multiplication (as in, "we seek an operation such that a(b+c)=ab+ac, and we will call it multiplication"), rather than as a consequence of the definition of multiplication (as in, "since 12x5 is 12 fives, we can use two products we already know: 10 fives + 2 fives")? Do I have this right? But that does not mean you can’t help them to understand where those table values come from. Indeed, I think you should. You write “That 3x4=12 because it is defined that way (rather than because 3 groups of 4 is 12)?” And there in your own parentheses is the answer to your own question. Your example is in terms of the mental concept of multiplication, not repeated addition! Taking 3 groups of 4 corresponds to multiplication. It is not the only operation that does; multiplication is multi-faceted (unlike addition). What 3 groups of 4 does not correspond to is repeated addition, though with such a simple example it is easy to confuse the two. See the Nunes-Bryant book I recommend in my September 2008 column for details on all of this. I am not sure if I ever really thought of multiplication as repeated addition. Certainly, once the concept of a ring was introduced me, I understood that the two concepts were distinct. Mind you, I can at least loosely be described as a mathematician so I suppose that it is not surprising that I am in agreement with you. Some years ago, I taught a course in real analysis out of Rudin's `Principles of Mathematical Analysis'. Rudin starts off by assuming that Q exists and proceeds to construct R from there. I personally find this approach a bit unsatisfying; after all, where does Q come from? I'd live with it if my department had any course which really deals with the logical foundations of mathematics, but it doesn't. To fill in the gap, I wrote up a (long) handout on set theory and the constructions of various number systems. Pedagogically, this may not have been a great plan. Certainly, Halmos turned in his grave. However, I at least learned a fair amount, although in some respects I feel that my understanding of what a number actually is has diminished. Before you posted this column, my set theory handout glossed over the recursion principle. In fact, it still does, but at least I now state a version of said principle and include a somewhat vague explanation of why it is needed. It should be pointed out that any opinions given in the handout and in this post are my own, and do not necessarily reflect the views of my university nor my department. You are making a common error: you're making absolute statements of fact without first agreeing with your audience on a set of axioms. Mathematicians are easily tempted to do this, because we are accustomed to working in a context where certainty is available. However, it's not tenable in a discussion of mathematics education. You seem to take the position that a student first learning to multiply should be prohibited from drawing connections to their prior knowledge of addition. I regard that as abusive. However, neither of us can honestly claim that he is certainly correct. 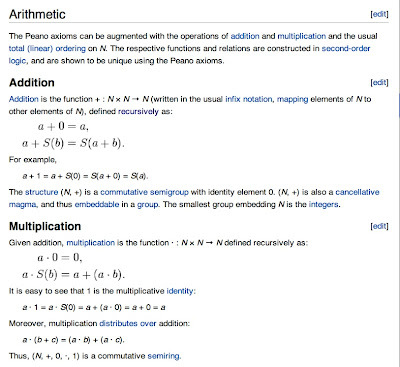 James, my column is about how multiplication is defined in Peano arithmetic. That is what the title says! It doesn't get any clearer than that in terms of what the axioms are. In an italicized aside I emphasized that I was not focusing on mathematics education, where the issues are very different. You are attacking a straw man. I have expressed my views on mathematics education in other columns, and in none of them will you find that "abusive" claim you ascribe to me. On the contrary, you will find many statements about the importance of students connecting what they learn. It's about as repeated as it gets. Anonymous: Your first question is the heart of my column. Repeated addition is FINITE; you can repeat only a finite (albeit arbitrary) number of times. The Recursion Principle essentially extends that to the infinite. That is a highly nontrivial step. Not everything you can do for the finite can be done for the infinite. The infinite is not just a continuation of the finite. Recursion is not just “repeat infinitely many times.” It’s something very different. It requires axiomatic mathematics to move from the finite into the infinite. Stretching is different; it is continuous, not repetitive. Your comment “as repeated as it gets” confuses repetition with recursion. The problem the Greeks encountered, which you refer to, was that their two grounded notions of what-we-call-number did not hang together. They discovered that the numbers you obtain from counting (what we call natural numbers and positive rationals) were not adequate to capture the quantities that correspond to mensuration (what we call positive real numbers). It was precisely BECAUSE notions of length and volume are grounded in experience that their discovery came as such a shock. For many centuries after the ancient Greeks, mathematicians viewed quantities (measurement of length, etc.) as distinct from numbers. Only with the development of the real number system in the 19th century were the two finally reconciled. It’s not that mensuration leads by some form of predestined logical process to the real numbers; rather the real numbers can be GROUNDED in our experiences (as are the natural numbers). There are, as you note, other notions we can develop. But that is a totally separate issue from the means available to a teacher to develop mathematical concepts by starting with, and drawing on, human intuitions. I'm not confused -- mutiplication of integers is primitive recursive - it can be defined via a bounded loop construct. (Again, look up Hofstadter's Bloop & Floop - multiplication is primitive recursive and only needs the power of Bloop or something equi-powerful, in order to defined in terms of addition & looping.) Of course you can use something strictly more powerful but it's not necessary. Peano wasn't forced to use general recursion because the nature of multiplication of integers required that much power. A bounded loop means repeat so-and-so (a finite - though variable) number of times. That was the point -- a bounded loop *is* simple repetition. And that's all that's needed for *this* particular job. 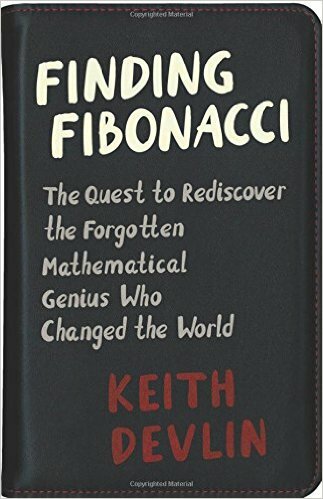 No, what you are talking about is how to COMPUTE the product of any two natural numbers, which is not the same as DEFINING a function from NxN to N. The latter is of necessity an infinitary object, and to get those you need existence axioms. Recent comments submitted (but not yet published) have attempted to move the discussion off topic to argue viewpoints on (1) how to teach K-8 mathematics and (2) the role and desirability of formalism and rigor in mathematics. Since both of those issues have already been raised by responses already published, I have asked the editor (it's not me) to close the comments thread. Thanks to all who have responded. An excellent reference on this and related matters is the award-winning exposition: On Mathematical Induction, by Leon Henkin, American Mathematical Monthly, Vol. 67, No. 4 (Apr., 1960), pp. 323-338.